A new book will be available Tuesday that examines the beginning of modern supply-side economics, and how the first President to suggest the successful economic policy was actually, a Democrat. Although Ronald Reagan launched an economic revolution in the 1980s, he was not the first president to put supply-side economics into practice. That honor goes to John F. Kennedy. JFK and the Reagan Revolutionbegins with events surrounding Inauguration Day 1961, then ventures backward a bit to set the scene, and then it starts playing out like a daily recap of what was happening. The calendar moved into 1962 and into 1963, and the whole time, the reader knows what’s coming in November 1963, but not so much about what was happening on tax rates and monetary policy as we learn in this book. Most of us are familiar with two things about John F. Kennedy’s presidency, even those of us who were not alive when Kennedy was president: the inauguration on January 20, 1961 in the freezing cold which included Robert Frost reciting a poem, and also included the “ask not” phrase that Kennedy delivered flawlessly; and the tragic end of the Kennedy presidency at the hands of an assassin. To properly tell the story, the authors put particular focus on a period in 1962 when John F. Kennedy took the gloves off and really went to work on his tax plans. To do this, Kudlow and Domitrovic focus on three big speeches that Kennedy gave that year. President Kennedy was a man who knew what he was talking about as he hit his stride in making this case for tax reform, he knew that economic growth was both necessary and achievable. His rhetoric would start to take the shape of legislation early in 1963, so the December 14 speech was a great time to be in top form. The Kennedy presidency ended on its 1,036th day, and with the bookends being January 20, 1961 and November 22, 1963, there was a remarkable development of economic policy in between. This policy would be started by John Kennedy, and it would be passed into legislation after Kennedy’s death by president Lyndon Johnson. The Kennedy tax cut was stalled in the legislative process at the time of his assassination. It took President Johnson and his special way of getting things done to finally pass the legislation and get the bill on his desk for signature. The first downside here was that LBJ himself, like many others on the left, was also not a believer in tax rate cuts, despite the economic growth that ensued because of the rate cuts. Eventually he started to chip away at reversing the tax policy until it no longer resembled what John Kennedy had envisioned. The second downside was that while the tax cuts did achieve their purpose and the economy did improve as people went back to work, the government collected more tax revenues and with Democrats controlling things at the time, government promptly grew. Dollars for D.C. meant spending projects galore. And of course, it was at this time that LBJ’s Great Society was given life. As interesting as anything else revealed in this book, is the care and concern that JFK felt for the poor and those in poverty. The authors point to John Kennedy as being someone that we might least expect to be as concerned as he was about the less fortunate. Given the later actions of Robert Kennedy, perhaps we should not be as surprised as we might be. John Kennedy would recognize, “our cities are being engulfed in squalor.” Kennedy wanted to do something about this, but his solutions deviated from those of other Democrats. The difference between Kennedy and Johnson could not have become more clear. As the authors note, “Kennedy would detail some new achievement that the nation could make if the growth rate jumped, including alleviating poverty, building schools, and enhancing national defense.” In contrast, Lyndon Johnson saw government as the answer. To the surprise of even the most ardent voices on the left, this increase in government spending did not alleviate poverty, it entrenched people in it. It is most instructive to look at the movement on tax rate cuts by the political parties. Here was John Kennedy in the 1960s going against the grain, and going against most of the advice he was getting. More spending was the order of the day, just keep spending money and the economy will recover. Going back in time, Democrats in the 1820s and 1840s had an understanding of the Laffer Curve, well before there was an Arthur Laffer. The Democratic party of the 1800s knew incentives mattered, and that they worked. The economics profession has always felt an embarrassing sting from the success of supply-side economics as it went counter to much of mainstream economic thinking. Worse for the economics establishment, the best advocates were not economists, simply people who understood the concept and were able to explain it: think Robert Bartley, Jack Kemp and Jude Wanniski; and think both presidents John F. Kennedy and Ronald Reagan. Even though Robert Mundell and Arthur Laffer were economists, they can easily be dismissed. The Laffer Curve can be laughed off as a cartoon on a napkin, rather than a simpler explanation for what the establishment wants to pretend is too complex for the commoners. An argument avoided by the Left of today is an argument that John F. Kennedy made in advocating his supply-side tax policies, that getting our tax rates right alleviates poverty, educates children, puts people back to work and allows for a better national defense. The professional Left is haunted by the success of John F. Kennedy’s tax policies. Their party today does not recognize what Kennedy did. So much so that even John Kennedy’s daughter Caroline and the late Ted Kennedy once requested that John Kennedy’s image not be used when advocating for tax rate cuts. Kudlow and Domitrovic point out the fallacies in these arguments. And speaking of the professional Left, the New York Times is exposed once again, this time byKudlow and Domitrovic, even if briefly. But theTimes’ misunderstanding of economics is important for a newspaper with a readership as large as theirs. They have never understood what worked and why, not in the 1960s or the 1980s, and if they cannot grasp the importance of this, how can they properly convey what is happening today or will happen in the future? This comes down to knowing who to trust. The New York Times has been wrong on this issue for over half a century and counting. Why would we believe them now? And they serve as source for so many others, when they get it wrong, all their disciples get it wrong as well. Before we knew it, they had us believing that what happened did not happen, and that what did not happen would have been really scary if it happened. They do not see that two presidents, both of different parties, tried and succeeded in the face of the loyal opposition. Perhaps if President Kennedy had lived, either his bill would not have become law at all, or his longer term success would have been more convincing to the skeptics. President Reagan got his tax rate cut in the first year of his presidency, and he got to tinker and reform and got the mix just right so that he oversaw seven incredible years; the “seven fat years” as dubbed by Robert Bartley. An important part of this book is the latter third that details the years after the John F. Kennedy tax rate cuts went into effect, and this includes the Reagan Revolution and brings us right up to the present. 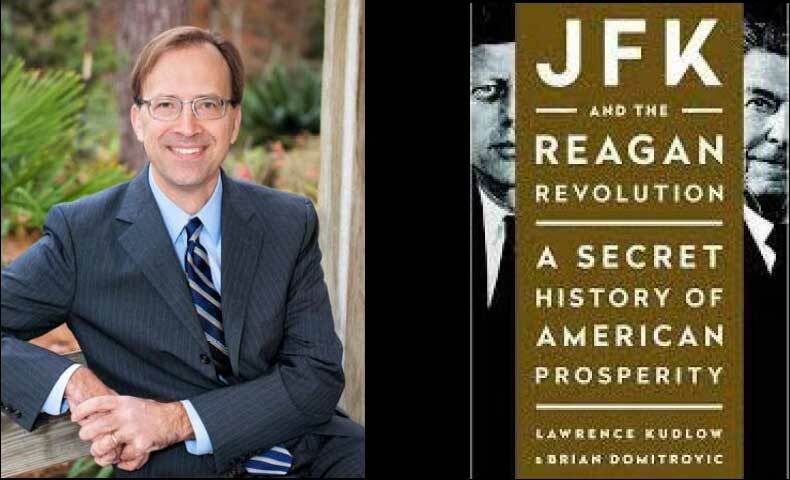 Larry Kudlow and Brian Domitrovic have done a tremendous service to the study of history, as well as economics, by writing this book.JFK and the Reagan Revolutionis very easy to read and the storytelling is compelling; it is rare for a book like this to be both of these things. As they reveal, getting things right is not as complicated as some would have us believe. It has been done by both parties in the past. Freedom and prosperity are not opposite ends of the same rope; they are what the next generation of supply-siders can help us achieve by learning from the past and winning the argument. Good review; book sounds excellent. My only criticism involves why the authors did not give Pres. Coolidge the credit he deserves. Coolidge gets some credit in the book, but obviously the book was about JFK. I think one of the main premises was that JFK was a Democrat who adapted what was ultimately to become a Republican issue, cutting tax rates. If the book had implied that JFK was the first supply-sider, then the Coolidge charge would carry more weight. I hope you read the book.